On Thursday, Assange was arrested in London at the Ecuadorian embassy where he had been taking refuse since 2012, before the country revoked his asylum and turned him over to UK authorities. Assange is accused of conspiring with WikiLeaks informant Chelsea Manning to steal and publish secret government documents. In the US, he faces up to five years in prison. At a court session regarding his possible extradition, US government employees and lawyers were present, the BBC reports. Assange’s lawyer is arguing against his client’s extradition to the US, arguing it could entail a threat on his life. Assange left court without any decision being made. The next hearing is scheduled for May 2. 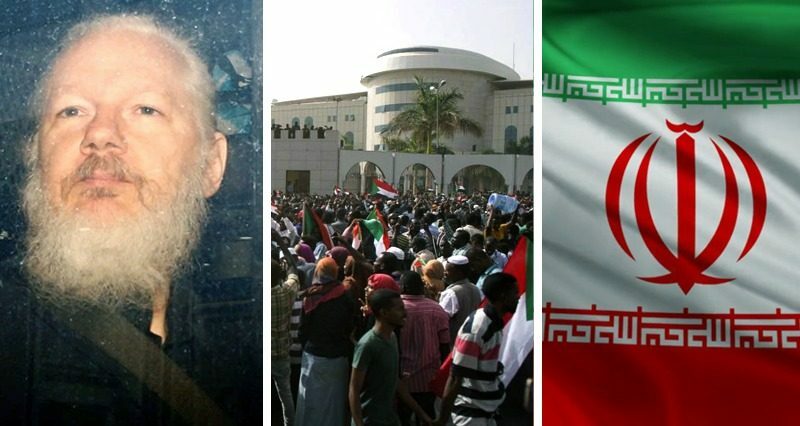 A coup d’état took place in Sudan. The army announced the removal of President Omar al-Bashir from power and the dissolution of parliament. The military announced the suspension of the constitution, as well as the dissolution of all existing authorities. Sudan’s Minister of Defense, Lieutenant-General Awad bin Auf, announced the seizure of power in the country by the military which will stay in power for two years to help facilitate a transition period. A military council has been formed in Sudan and a state of emergency has been imposed for three months. In addition, a month-long curfew has been introduced. The United States will now recognize the Islamic Revolutionary Guard Corps (IRGC) in Iran as an international terrorist organization, President Donald Trump announced. This is the first time that Washington has declared an armed formation of another state a terrorist group. Iran responded by declaring the contingent of US forces in the Middle East a terrorist organization, according to Iranian state media. The US will keep its sanctions regime against Iran in force and continue to put on pressure.